Website under construction.. excuse the mess. My name is Stacy Perez of Chicago, Illinois. I am a stay at home and work from home mom of two kids. 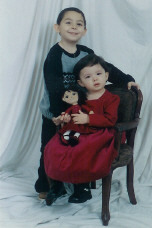 My son, Kyler was born November 1999; and my daughter, Angalynn was born February 2002. My kids are my WHY, and the reason why I am where I am today. While pregnant with Kyler, my mind starting shifting in the direction of where I wanted and needed to be. Realizing being a stay at home mom was what I needed and wanted to do.... AND the result is Staying at home and making a living right online. Over time.. My children will learn how to be "work from home kids" ... They are already starting to duplicate what I do now.. It is amazing how children are like sponges. Making Money Online... How To Do It? You will find most people who want to work from home, want to do it right on the internet. It makes sense. They want to work from home and working from home means not leaving the house. What I have found is it may be a challenge for most people to find an opportunity and actually make money from home. Honestly, owning websites has given me the ability to make a living online. I am able to utilize the websites to making multiple streams of income. The problem ... Most people do not have the knowledge to create a website from scratch or even have the know how to make money with it. Or people join a work from home opportunity and do not create a separate website to be able to create a warmer and more friendly way of delivery the information they want to deliver to their visitor. Here is the solution .. GDI. GDI gives anyone the ability to create an affordable website without having the knowledge or skill. GDI is absolutely incredible. Not only can someone make multiple streams of income, but they have the ability to help the children start life on the right path. Children duplicate what the parents do. GDI will allow children to create their own identity while making an income as well. For one of my websites, DotComMommies.com, it costs me $20/ a month in hosting expenses. The domain I pay to another company. I certainly do not make any money when I refer someone to my $19.95/month hosting company. With GDI we make $1/month every month for one person. Do you see what would happen to your income? When I think about all the labor, research and time to make a website from scratch, I think WOW GDI is going to make a lot of dreams come true!!! GDI free for 7 days. Play around with it. I am sure you will be thrilled. If you decide to keep it because you love it, it is only $10/month.